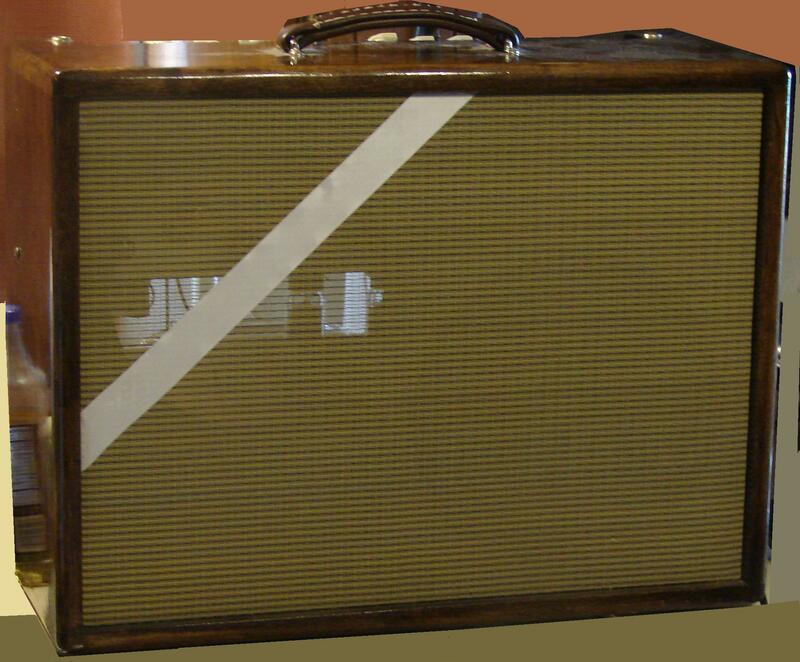 Construction of a Guitar Amplifier Worthy of the Effort | Miscellaneous Circuits and a link. This post is a diversion from the alternative energy area, but it is about something many can appreciate, and so this post is about building a Guitar Amp, and not just any amp, but an homage to the Fender Vibrolux. What I began with was a metal chassis for a Fender Hotrod Amp, but it had been stripped of everything. So this was essentially going to be from the ground up. Now, the power transformer and the audio output transformer are usually the two most expensive pieces. I happened to have both from an amplifier that came from a Rockola. That amplifier was a “Type “O””, and it had been converted to a PA amplifier back in the 1960’s, and since I could not find a buyer for the amp as it was, I just stripped that chassis down and set the parts aside for later use. This amp build is that later use. Not knowing fully the ratings of the power transformer, I made it a point to allow for a different power transformer to be used if this one lacked adequate power- something that proved to be a pointless concern- that power transformer had plenty of power to spare. Armed with the schematic of the orignal amp (Vern Tinsdale’s site had that.) I looked at a number of amps for a basic design to work around, and settled on making a variation of Fender’s “Custom Vibrolux”. A significant portion of that amp is straight from design books of RCA and other tube manufacturers over the years. The major points that are Fender’s design are in part in the tone stack and in part the Vibrato circuit and “C” supply aspect to some extent. This amp I built is a “one of a kind”, and an “Homage” to the Fender Vibrolux. Other amps that I will build in the future will have different tone stacks and effects will be made differently- although the driver circuit for the reverb tank is almost textbook, and in a pinch I could sub in a 6AQ5, 6EH5, 6AR5, etc with just a socket swap and modest circuit changes. Because of this I am not putting up the final schematic. Other amps in the future- certainly, just not this one. If you want to try build you rown, that is up to you, you can get the power and output transformers from Hammond manufacturing and Fender is gracious enough to have many of their amplifier schematics online. I am not linking to them, those are for your own research. Now to be clear- this amp was not going to be a total ripoff of their design, that was not the intent, but rather this amplifier is an Homage to their design and to see if it could be accomplished with what I had available- with a few important tweeks and differences, their design only gave a starting point, and there have been different vesrions of the Vibrolux since it was introduced in the 1950’s. To say the least, this amplifier is a “one of a kind” largely because many of the parts I used were the only parts I had of that type on hand, and with the PIO’s, most of those vendors who have them in their catalogs in North America are lacking many of the values you would need. Any other amps I build in the future will be different- even if inspired by other amps manufactured by the big name companies, there will be notable circuit differences in what I put together. Paper In Oil or “PIO” capacitors are in the audio path of my design variant, and effects use polyester or styrene capacitors. Many values differ because of the inventory I had on hand demanded it. I also built up a separate supply board for the “C” voltage- which is a winding in the Fender transformer and the Hammond replacements just taps it from the “B” winding. I also used a 3 wire choke instead of the 2 wire choke Fender used. I also added a wiring fault indicator, wired at the EMI filter I also used that which the original design did not. My output tranformer also had 3 impedance taps- an 8 Ohm, a 4 Ohm, and a 2 Ohm. The external speaker jack is wired in a manner where the plug also changes the impedance tap that connects to the outputs. I used 8 Ohm impedance speakers for the basic testing and the final cabinet speaker- which is hardwired to the amplifier for reliability is a single 12 inch Emminence “Delta 12A” speaker instead of a pair of 10’s the newest rendition of the Fneder Vibrolux uses. I also used numerous terminal strips instead of a “turret board” for assembly, as well as carbon film resistors for longevity and stability. Because of space needs, the tone controls are ganged for Bass and Treble-with individual volume controls for each input. Both preamp stages are identical with the exception of one having a PIO on input and one having an “Orange Drop” (A type of high quality mylar capacitor that Sprague still manufactures.) on input. The Fender design adds a small bypass cap to the volume control for the second input to make it “bright”- something I ommitted. I also used ceramic octal sockets and the small tubes have a socket with twist lock shield that is spring loaded. The separate C supply was in a voltage range I did not have working voltages for among my capacitor inventory, so I put 2- 47 microfarad 50 WVDC capacitors in series cutting the capacitance in half but raising my working voltage. Using 2- 220 microfarad 50WVDC capacitors gave me the value for the first capacitance in that supply as well. I also used a full wave bridge rectifier instead of half wave rectification not knowing for sure if I had adequate current available. The 18K resistor is a standard value resistor and is the main current limiting device for the C voltage in the Fender circuit. Now the applied C voltage where it is injected to the audio/effects stream requires the C supply to be positive grounding to the chassis so the C voltage can take the signal grid of the 6L6’s below the chassis potential to cutoff where the slow speed oscillaltion of V5 (on the Fender schematic) modulates that cutoff point creating the Vibrato. Initially, I installed a switch so resistance could be switched into the C supply circuit to bring some range into adjustability with the original value pot I used (which is explained later. )- I did leave it in after some changes mentioned below, but when it is switched into the circuit there is a notable loss in volume. The resistance I selected for best audio effects results turned out to be 470K Ohms in the C- circuit between the supply and the control. Fender indicates in their schematic 55 volts peak to peak- the voltage in mine is different due to the different values used in the Vibrato circuit and the selection of the 470K Ohm resistor was done by ear. It has been a little while since I measured the potential and the amp is well buttoned up now as I write this, but I seem to recall I measured with my meter- about 28 volts. Since the Vibrato worked very well, I left it at that value. Now, the original chassis initially had a number of holes in it, some I could use as they were, and some I had to enlarge, or just place something over the hole. It had seen one attempt at a homebrew amp before, which did not progress very far, which left the chassis still workable. This time, the chassis would see a final design built upon it. This was what I began with. While the image was taken near the completion, it shows the vertical “down” position of the 5U4 and the 6L6GCs. they have clips on the sockets to hold them in place. It worked out to be a good decision as the tubes hang down in the airflow of the cabinet. I used a piece of double copper clad fiberglass circuit board as a radiant barrier on the lower board, and there is another on the amplifier back side due to 2 large power resistors which were needed to bring the B voltage down to a level safe for the filter capacitors. 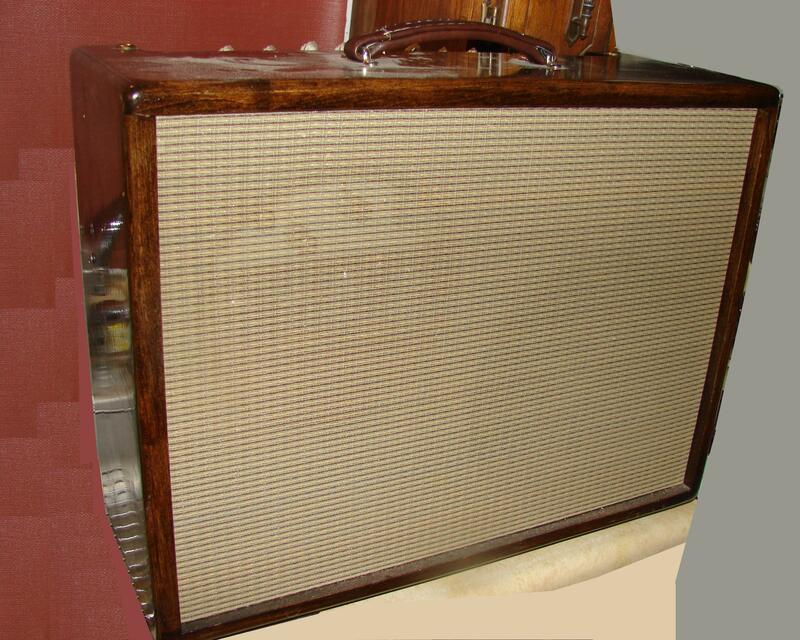 This also brought the nominal power of the amplifier close to the Fender Custom Vibrolux. This also brought the power into the output transformer’s “sweet spot” which is important for longevity. *If in the future a different output transformer is used, with changes to the filter capacitors and elimination of 2 resistors (a 1000 Ohm and a 2000 Ohm power resistor visible in the oneimage) in the B circuit- the amp becomes a screamer in excess of 50 Watts into 8 Ohms with a 5U4 because the plate voltage without those 2 resistors is in excess of 510VDC. Tube complements on guitar amplifiers and Hi-Fi tube amps tend to use 12AX7’s, 12AT7’s and 12AU7’s. There is no difference here- but final selections were not made without trying different tubes in all locations. Especially since the tubes I used for initial testing and troubleshooting were random box grabs of tubes I had on hand. When the new tubes were installed, the amp became unrully where the old tubes actually sounded great. This however led to meticulous inspections of solder joints, and componet values. The initial impedance matching transformer I used for the output to the Reverb tank seemed to be a new old stock piece that had never been used- it turned out that as B voltage increased the transformer developed an open circuit. So to replace that I dug through salvaged transformers and located one for a 6AQ5/6EH5 to 8 Ohms. (The actual realized impedance on the primary of an audio transformer is dictated by the impedance or load on the secondary. Something many people forget.) The solder joints were fine, but one terminal where a nickel plated component lead was wrapped in needed some attention to actually look reasonable and reliable. Ultimately when everything was done, Reverb is clean- no culvert sound to it like some cheap stereo reverbs can sound- this was clean and gave good sustain time. A project like this is usually best done in stages. Heath made their kits this way for a good reason. If you forgot a wire connection (and I did forget one wire) it was located by simply compairing the stages in the order they were assembled, and the missing wire became glaringly apparent as it was one that transitioned from one stage of construction session to another stage of construction session. These things happen. The key is finding it in a timely fashion, which I did. Now the reason the new tubes were so unruly was due to a couple of factors that added together. The foremost issue was the B voltage. 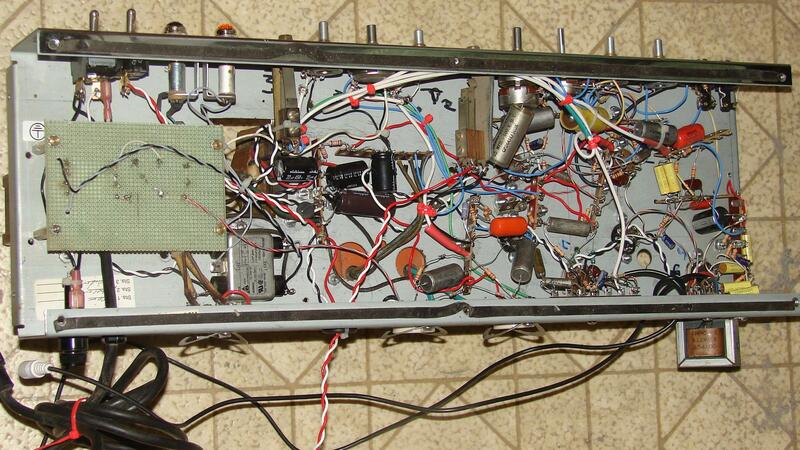 I had the amp operational with high B voltage, well above that of the Rockola design. I added in resistance to bring that voltage down to a point where the filter caps would not be stressed. If I had left it as it was, the B voltage would have been 515 volts. Too high for the caps I had used to be left that way, but one option was to get some new caps and just live with it, however the output transformer would be severely stressed and likely to fail sooner rather than potentially never. With the resistors added in, things began to settle down. The remaining issue was the effects. The inter-relationship of the values of the controls for vibrato speed and intensity are fairly critical. Initially I used a 500K Ohm pot for the intensity instead of 250K Ohms. The higher value did allow for adjustment, but was not stable at the low end, and tended to have a rather “poppy” sound over much of the range. This even after the C voltage was “dialed in” experimentally intot he range of Fender design value. If I had set up substitution boxes on the 6L6 Grid Resistors, I could likely have dialed in a value that was less “poppy”, but it likely would still go into low frequency feedback. However the Vibrato also seemed very weak. It was not helped by my using an 82K Ohm resistor for the cathode resistor of the tube in the Vibrato section that was fed by the C voltage. At that point I dug out my buckets of pots to locate a 250K Ohm “Linear Taper” pot. While I could have used an audio taper pot, that would have meant most of the adjustments would be in a narrow adjustment range and difficult to find the “sweet spot”. The original is a linear type for a reason. So with the 250K Ohm Linear taper pot in place, things came to life. Reverb which seemed to me to be muddy and lackluster, began to be heard clearly. The Vibrato as well came to life. But I needed to reselect a resistance value to get the C voltage back in range as that now dropped to about one third of the C voltage it was before. Mind you, the C voltage is derived from a discrete 56 volt transformer, which means on a scope- the peak voltage is actually close to 80 volts. So I needed to dial that down to about 33 volts (as measured with a meter.) and was found experimentally with a substitution box again. Or rather back “up” with the new control. However when everything was sorted out and done, Vibrato was clean and clear. With that though the amp was still a bit “poppy”, so I started experimenting. One of the results that really opened things up and calmed things down was at C10 on the Fender schematic. Instead of a silver mica capacitor of 500pf, I used 2-0.001microfarad PIO capacitors in series (to raise the working voltage again) and it is in between those 2 capacitors where I added in a 15K resistor and 1000pf ceramic capacitor to ground in the way a bypass filter works- this alone ultimately removed a great deal of the “pop” and settled the amp down to a point where it was actually a nice clean sound. It was at that point where selecting the best sounding 12 inch speaker was made. As a baseline, I used a vintage Jensen Alnico magnet speaker from a decent vintage Newcomb phonograph. There was a slight difference between that and the modern Jensen 12 inch “P12Q” “Ted Weber” series sepaker, but they both still sounded slightly “shrouded”-for this amp it was much too similar to low end speakers on a low end stereo, but not quite as bad as those as the Jensens are a top shelf speaker, they were just not right for this particular amplifier. It was then when I tested the Emminence “Delta 12A” 12 inch guitar speaker. With a massive magnet that barely cleared the transformers of the amp, this one had plenty of potential for issues with the audio transformer, but that was magnetically shielded originally, so no issue when fired up completely assembled. If the individual I made this one for needs some additional gain, there are some tweeks I can do that may be worth looking into later, but for now- Let the good times roll. Ready to roll. The one speaker opening is left open for airflow. The passive solar blog- outgrowth from some projects of mine. 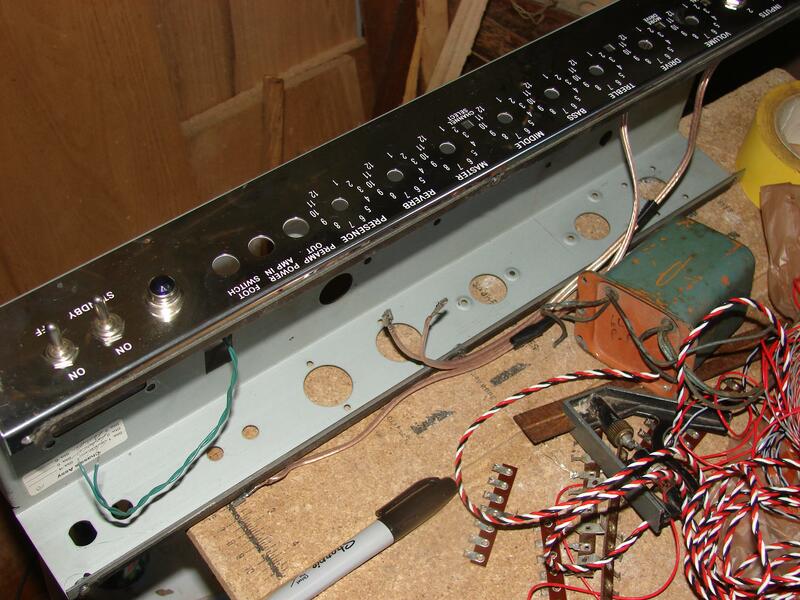 This entry was posted in Amplifier repairs, Auditorium equipment, Homebrew, Project, transformers, Uncategorized and tagged 6L6GC, Guitar Amp, Guitar Amplifier Project, Guitar Amps, Reuse of Juke Box Amplifier Parts, Rockola, Tube Amp, Tube Amps, Vibrolux. Bookmark the permalink.